Google Arts & Culture — a free app for Android and iOS — is designed to let you explore the world's greatest museums right from your smartphone. The app is a treasure trove of fine art, with high-resolution images and virtual tours from over 1,200 museums around the world. But that's not why the app has gone viral, hitting the top of the download charts this week. Instead, it's all about selfies. The latest version of the app matches your selfies with works of art, letting you check out your fine art alter ego. If you've seen photos of your friends next to famous portraiture on your favorite social networks, it's not because your friends have suddenly become art buffs: it's all Google. The app uses computer vision to compare each submitted selfie to its massive database of artwork to find the perfect match. (And for those of you with privacy concerns, Google says submitted selfies are deleted as soon as a match is found.) Google classifies the feature as experimental, which seems appropriate since the matches range from frighteningly accurate to outright hilarious. Finding yourself in fine art is simple. Just download the free Google Arts & Culture app on your Android or iOS device. Once it's installed, fire it up and scroll down until you see "Is your portrait in a museum?" Tap on it, snap a selfie, let Google work its magic, and then (of course) share the results on Facebook or Instagram. But unfortunately for selfie buffs, there's a small snag. While the app is available for download nation-wide, the feature is currently only available in select locations. 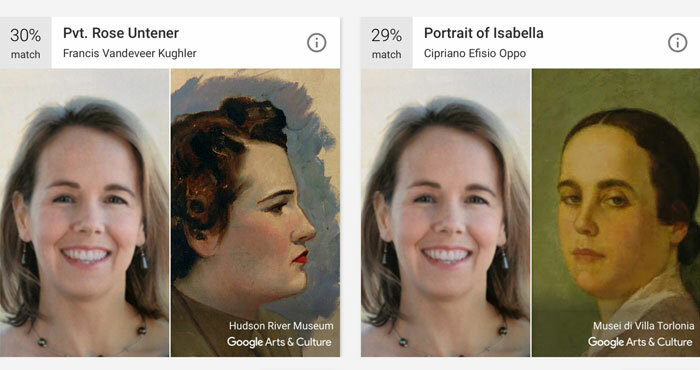 Though users in most of the United States can happily match their selfies to Google's art database, anyone in Texas and Illinois is left out for now. We're hopeful this Google is just refining this experiment before it launches across the country — but the fine art selfie craze could be over before everyone has access. Whether you're into selfies or not — and whether the selfie feature is available in your area or not — you can still use Google Arts & Culture to check out tons of amazing art. And, if you're feeling particularly industrious, you could always sort through portraits to find your artistic doppelgänger without Google's help. This feature does not work in Chicago! For some unknown reason, Google has not made this feature of the app available in Chicago. It’s so frustrating!